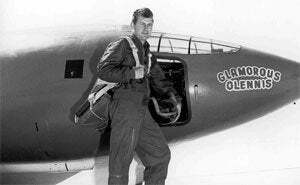 Beemans gum is a chewing gum made famous by pioneering test pilot Chuck Yeager who chewed it before every flight for good luck. The manufacturer, Cadbury Adams, used to make a single batch every 2 to 3 years. 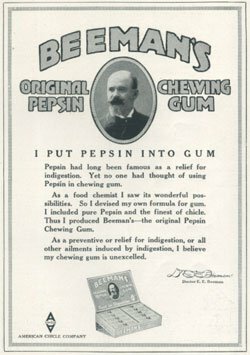 Beemans gum is a chewing gum invented by Ohio physician Dr. Edward E. Beeman in the late 19th century. Beeman originally marketed the gum, which is made of pepsin powder and chicle, as an aid to digestion. As far as we know pepsin has not been an ingredient for many years. The brand has changed hands over the years and was discontinued in the late 1970s due to low sales. Beemans is currently being made in a single batch every 2 to 3 years by the Cadbury Adams Company. Mom didn't allow gum chewing, in or outside the home, but kids being kids when we had extra coins whe would buy it anyway. I think the gum taste better maybe because we weren't suppose to have it.